Bring your hair to a new fashionable standard with TRESemmé. As the official hair care sponsors of New York Fashion week for over a decade, TRESemmé knows exactly how to get runway ready. Fashion week inspires many of us to try new looks that are seen on the catwalk. Your hair is one of the most important fashion statements you can make. So why not make it your best statement? 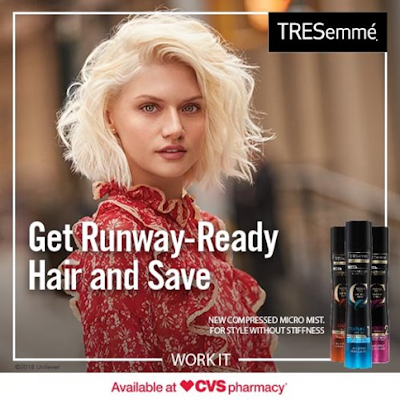 TRESemmé and CVS want you looking and feeling your best, whether your walking the catwalk or sidewalk. Rebellious waves are easy to recreate with a few simple steps. TRESemmé Moisture Rich Shampoo & Conditioner - Helps restore vibrancy and makes dry, damaged hair soft without weighing it down. Or TRESemmé Keratin Smooth Marula Oil Shampoo & Conditioner - Designed to fight frizz, detangle knots, boost shine, and add silky softness. TRESemmé Keratin Smooth Mask - To treat dry hair and add shine. Heat Spay - To protect hair against breakage. Mousse - To help had volume and texture. Use a round brush to blow out you hair. Use the brush to curl inward and outward while drying for more volume. TRESemmé Compressed Micro Mist, Level 2 Hair Spray - Add before using your curling wand to give your hair texture and help curls stay. Curling Wand - Section hair horizontally and curl 1 inch sections vertically around a 1 inch curl iron. Alternate by rolling the wand under and over to avoid all your curls going in the same direction. Hairspray - Use TRESemmé Compressed Micro Mist Level 3 or TRESemmé Level 3 Hairspray. Wear your waves for a second by using TRESemmé Fresh Start Basic Dry Shampoo. Keeps oily hair looking gorgeous. The weightless formula will leave hair looking clean and healthy, without a drop of water. All of these TRESemmé can be found at your local CVS store.